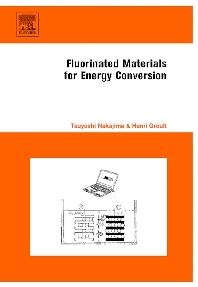 Fluorinated Materials for Energy Conversion offers advanced information on the application of fluorine chemistry to energy conversion materials for lithium batteries, fuel cells, solar cells and so on. Fluorine compounds and fluorination techniques have recently gained important roles in improving the electrochemical characteristics of such energy production devices. The book therefore focuses on new batteries with high performance, the improvements of cell performance and the improvement of electrode and cell characteristics. The authors present new information on the effect of fluorine and how to make use of fluorination techniques and fluorine compounds. With emphasis on recent developments, this book is suitable for students, researchers and engineers working in chemistry, materials science and electrical engineering. Chapter 1. Experimental and theoretical aspects of the fluorine evolution reaction on carbon anodes in molten KF-2HF (H. Groult et al.). Chapter 2. Applications of fluorinated carbon materials to primary and secondary lithium batteries (Tsuyoshi Nakajima). Chapter 3. Synthesis and electrochemical properties of new carbon anodes prepared by chemical vapor infiltration (Yoshimi Ohzawa). Chapter 4. Electrochemical properties of fluorinated carbon nanotubes (Hidekazu Touhara). Chapter 5. Fluorine-doped tin oxide electrodes for lithium batteries (Chai-Won Kwon et al.). Chapter 6. Synthesis of fluorinated cathodes and fluoride electrolytes for lithium ion battery (Susumu Yonezawa, Masayuki Takashima). Chapter 7. Physicochemical properties of fluorine-containing electrolytes for lithium batteries (D. Lemordant et al.). Chapter 8. Fluorinated anions and electrode/electrolyte stability in lithium batteries (R. Yazami). Chapter 9. Electrochemical properties of lithium electrolytes based on bis(polyfluorodiolato)borate and tetrakis(polyfluoroalkoxy)aluminate superweak anions (B.G. Nolan et al.). Chapter 10. Fluorinated electrolytes based on lithium salts of strong Bronsted acids (O.E. Geiculescu et al.). Chapter 11. Electrolytes for lithium batteries (Kiyoshi Kanamura). Chapter 12. Thermally stable fluoro-organic solvents for lithium ion battery (Jun-ichi Yamaki). Chapter 13. Physical and electrochemical properties and application to lithium batteries of fluorinated organic solvents (Yukio Sasaki). Chapter 14. PVdF based polymers for lithium batteries (J.-Y. Sanchez et al.). Chapter 15. Lithium-ion-conductive polymer electrolytes exhibit a high lithium-ion transference number with the incorporation of fluorine atoms (Takeshi Abe, Zempachi Ogumi). Chapter 16. Room temperature molten salts as new electrolytes (Rika Hagiwara, Kazuhiko Matsumoto). Chapter 17. Fluorine-intercalated graphite for lithium batteries (A. Hamwi et al.). Chapter 18. Battery application of graphite intercalation compounds (Yoshiaki Matsuo). Chapter 19. Fluoride-based electrolytes and their applications for intermediate temperature ceramic fuel cells (Bin Zhu, Bengt-Erik Mellander). Chapter 20. The use of Nafion in fuel cells (M. Odgaard). Chapter 21. Functional fluoropolymers for fuel cell membranes (R. Souzy, B. Améduri). Chapter 22. Films and powders of fluorine-doped tin dioxide (H. Cachet). Chapter 23. Doped transparent conducting oxides suitable for the fabrication of high efficiency thin film solar cells (A. Bosio et al.). Chapter 24. Fluoride technologies application within the Molten-Salt Reactors fuel (J. Uhlir). Henri Groult is Director of Research of CNRS-UPMC-ESPCI UMR 7612, University of Pierre and Marie Curie (Paris 6) in France. He has devoted his research life to fluorine chemistry, electrochemistry, and molten salt chemistry. His main research subjects are electrolytic production of fluorine gas, fluorine compounds for primary and secondary lithium batteries, and electrochemical properties of molten fluorides and chlorides. He has obtained interesting results on fluorine evolution reaction on carbon electrodes, discharge behavior of carbon-fluorine compounds, charge/discharge characteristics of metal fluorides, and electrochemical properties of molten salts. On these subjects, he published more than 100 papers and 7 books. His activity has played an important role in fluorine chemistry in France. He has served as Director of the French Network of Fluorine, Chairman of the 17th European Symposium on Fluorine Chemistry (Paris, July 2013), and Editorial board of J. Fluorine Chemistry.